In this stage of Santiago Road on bike, we’ll go from Carrión de los Condes to León. It is a quite long road but with a very simple profile, in which, besides, we can travel the majority of the road by concrete ways.. Just by pedaling, we’ll leave Tierra de Campos behind and we’ll enter to León providence, going through long distances without any population. The only hard-time of the day, we can find it at León entrance, due to the streets full with a lot of traffic and turns. Because of this, in Tournride we offer to cyclist pilgrims an alternative to enter to León which doesn’t have Jacobean signposting, but it is way easier. If we make this stage at summer, we must improve our sun protection and always take extra water bottles with us. 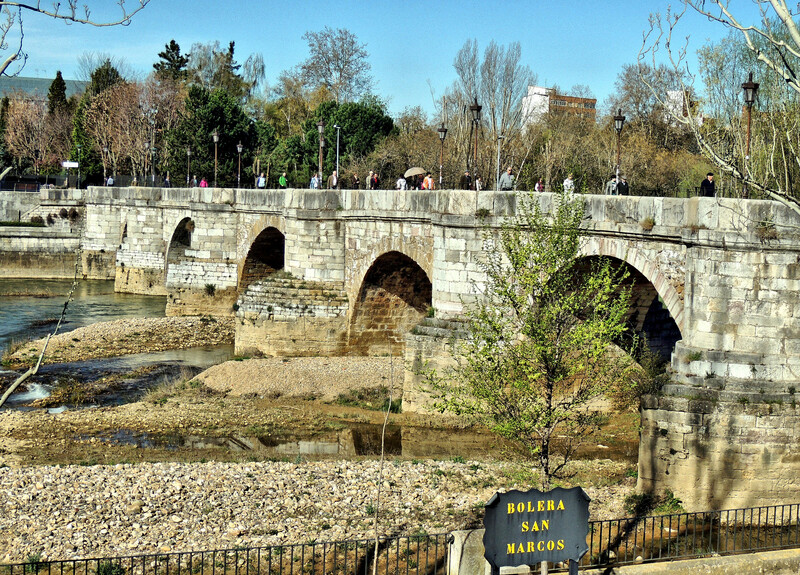 We cross the Puente Mayor at the end of Carrión and we go on through San Zoilo Street. We cross two roundabouts on a straight line and we take the PP-2411 during 3, 6 km, with a flat profile. 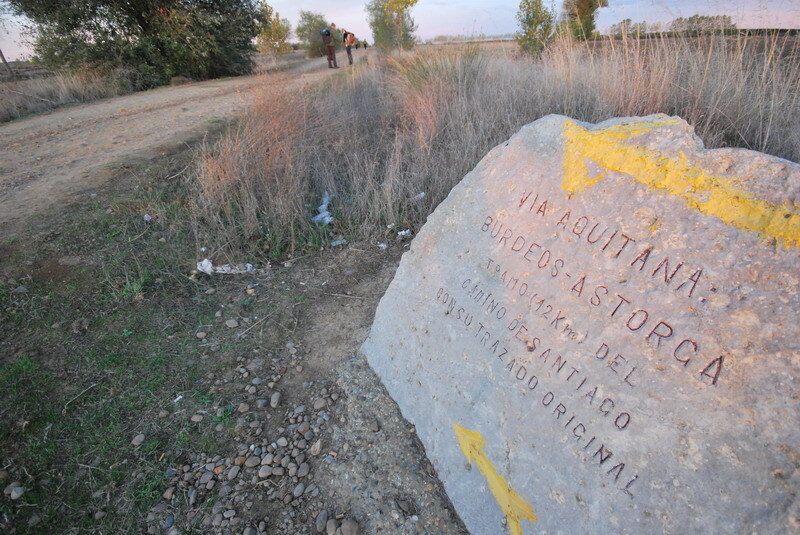 The PP-2411 turns to right, but we continue forward by a land path which coincides with the old roman via Aquitana. This is a straight line of 11 km between fields, in a flat profile with a light positive slope at the end. This creates a gradient change that blocks us from seeing Calzadilla de la Cueza until we practically arrive there. After crossing Calzadilla de la Cueza the road passes by a parallel path to the N-120 and in about 5, 6 km it leads to Ledigos. The first half of the road needs to be done ascending softly (40 m difference of height), but before arriving to Lédigos, it goes down again. 1. Following the Jacobean route entering in Terradillos. There, we take a path during 1, 2 km that, after crossing the P-973, it takes 1, 5 km to get to Moratinos. After passing by town in 2, 5 km we arrive to San Nicolás del Real Camino and by leaving this, we hook up again with the N-120. 2. Going on by the N-120 without entering to Terradillos de los Templarios. We go directly to the end of San Nicolás del Real Camino, with no chance of visiting in between the towns. After leaving behind San Nicolás del Camino, the N-120 goes across the Valderaduey River and, right after, there’s a small path that exits to right in a perpendicular way. If we take that one, we’ll go to visit the Chapel of La Virgen del Puente and from there we continue through a path to Sahagún. If you don’t want to visit the chapel and you rather keep on going straighly to Sahagún through the N-120, you need to know that the road borders Sahagún by the North. Due to this, when we read the sign that indicates the detour to the center of the city, 10 km after exiting Terradillos de los Templarios, we must go through the right track in order to enter to the village and visit it. Sahagún (Km 41 of the stage) it is traversed from East to West, crossing the Cea River to go up and take the León road during 1,5 km until it leads into the N-120. We follow the road by the N-120 during 2, 2 km till we see the junction with the A-231 and LE-6711. Alternative road: on the junction of roads turn to right to take the LE-6711, which by an overpass goes across the A-231. It leads us directly to Calzada del Coto and from there, we have to alternate concrete roads and land paths during 32 Km to get to Mansilla de las Mulas, where it takes back to the traditional road. 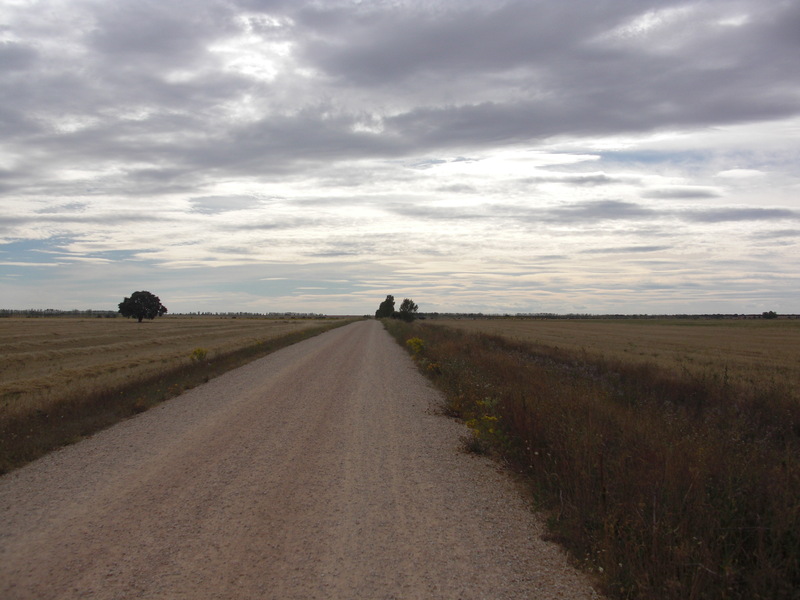 This road also passes by Calzadilla de los Hermanillos. The profile is simple, with a light ascent until passing behind Calzadilla de los Hermanillos and with a soft descent until getting to Mansilla. Traditional way:on the junction of roads we move forward and see the road N-120 takes a curve to the left, few meters away. At this point, it takes to a very short land path to the right that leads into Calzada del Coto, which it is a double track concrete road with a parallel dotted land path with equidistant threes. After covering 5, 5 km in flat profile we get to Bercianos del Camino. We cross by la Calle Mayor and, after, we go back again to the same light ascent during 5, 3 km until we get to an underpass to the A-231. Once we cross it, we arrive to the Burgo Ranero. This is practically a flat profile. From the Burgo Ranero until Puente Villarente we always take the LE-6615, which leads in permanent descent with a similar appearance to the Calzada del Coto. 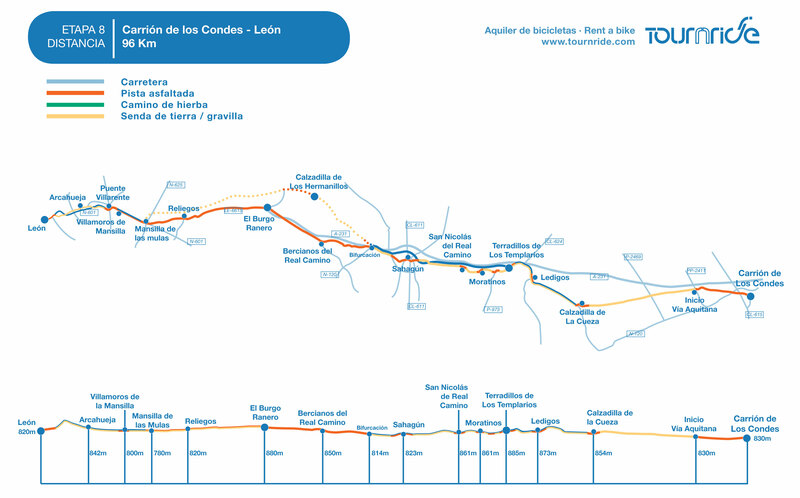 First, we need to cover 14 km till Reliegos and then another 6km till Mansilla de las Mulas. 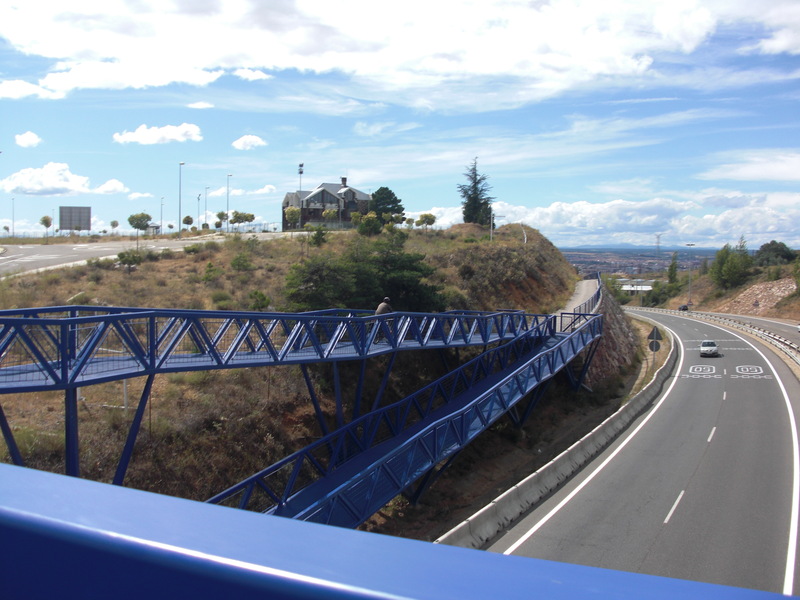 After we get to the intersection between both paths in Mansilla de las Mulas, we should go out of town through Northwest in order to take the N-601 during 4, 5 km until Villamoros de Mansilla and, later, travel another 1, 5 km until we get to Puente Villarente. 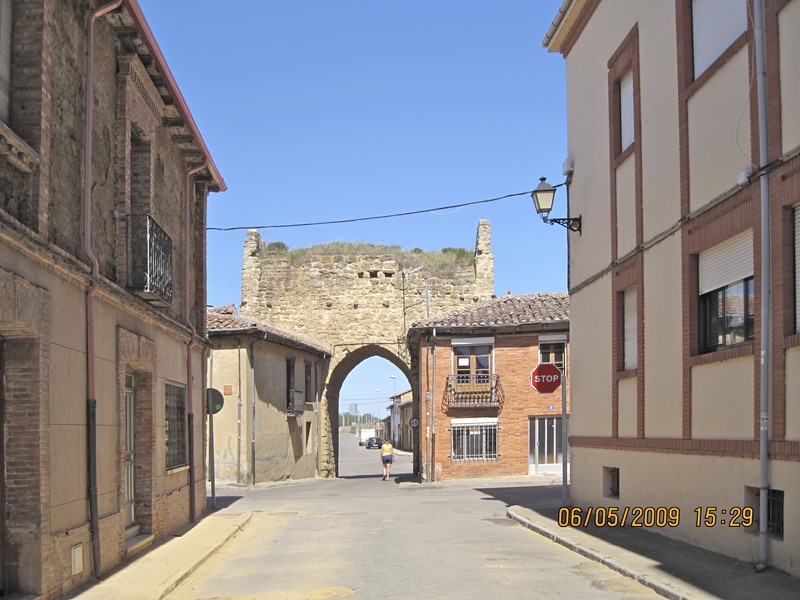 Traditional road to enter to León (with Jacobean signposting): At the exit of Puente Villarente there is a wide land path that takes to the right. At the beginning, it goes in a flat direction, but around 3 Km it gets to Arcahueja and from there; there are a couple of slopes that take us to a path which borders the N-601 to a higher height. The path ends at the industrial estate of León and from there we need to cross the N-601 by a higher pedestrian walk (which it is on slopes, without stairs). From this point, the arrows indicate the entrance through Puente Castro, until arriving to a big roundabout where we must turn left. When we get to see la plaza de toros de León, we must turn right in order to go through Corredera Street until we get to the old part of the city, where we can find the Cathedral. It can get complicated following the traffic signs (signposting) because of the multiples turn. The majority of them are arrows painted on the ground or in lamps. Entrance by the N-601 (without Jacobean signposting): At the exit of Puente Villarente we must keep on going through the N-601 during almost 9 Km, crossing several roundabouts until arriving to the industrial estate of the city, where we will pass by under the blue pedestrian walkway. After a couple of curves on the N-601, we will finish in a roundabout where it is located a welcome sign with the León shield and a clock in the superior part. We must go across straightly the roundabout to go through the Europa Avenue until the next roundabout, which has a long form. At this point, we take a detour obliquely to the right (Reino de León Avenue and then Juan XXIII Street) and we continue forward leaving behind six crossroads until getting to the seventh, the one located at San Pedro Street. Turning left, in this street we will get to Cathedral in only 300 meters. In a general point of view, it is a long stage but with characteristics of an extremely simple profile and long distances between the Jacobean villages. The big part of the pedestrian road covers parallel paths to the N-120, to the Calzada del Coto or to the N-601; so that we can choose between going through them or travelling through concrete. The paths are narrow but stable. If you go by the highway, be really careful at the entrance of León, because you can find a lot of traffic. If you think this stage is too long for you, Tournride recommends you taking a rest in Reliegos (km 69 of stage), Mansilla de las Mulas (km 75) or Puente Villarente (km 82); where you can find all the services that you need. If you start your journey in Carrión de los Condes, at Tournride we help you getting there. Regardless where you come from, you have to go to Palencia, León or Burgos to take a bus that will take you straight to Carrión. Out of the three cities, León is the only one that has a regular commercial flight. The destination is Barcelona and it is operated by Air Nostrum. The buses frequency at Carrión is not very high, so that’s why we always recommend taking a look at the schedules previously. The companies Estébanez Aja and Abagon cover the route from Palencia. 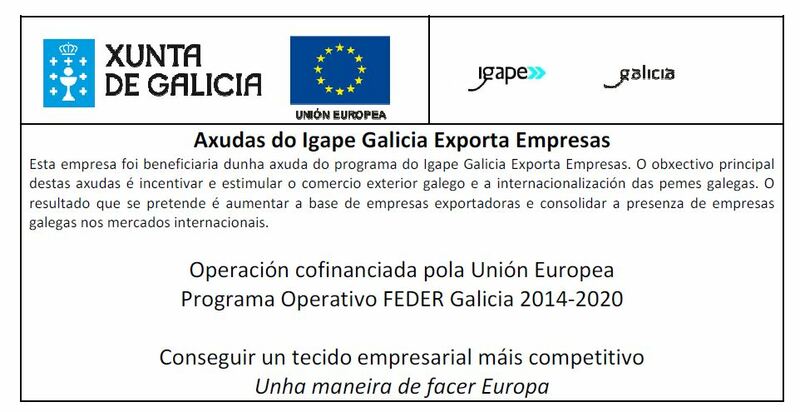 To go from León or Burgos you should go with Alsa. If all these buses schedules don’t follow your needs, you can always take a taxi in Palencia, it will cost you around 45-50€. Or, instead, if you are lucky enough, maybe you will find someone at a carpooling platform who will take you for only 3 to 5€. Remember that at Tournride we leave your bikes in yourejamos las bicicletas en vuestro lodging back in Carrión de los Condes if you start from there and, we can take your left baggage in order for you to find it at the end of your road.. In this stage, there are huge distances between the localities, especially from Carrión de los Condes to Calzadilla (18 Km) and from Burgo Ranero to Reliegos (14 Km). There are not any kind of water source in the middle and few places where you can rest. So we recommend you to sustain yourself perfectly with water and food. 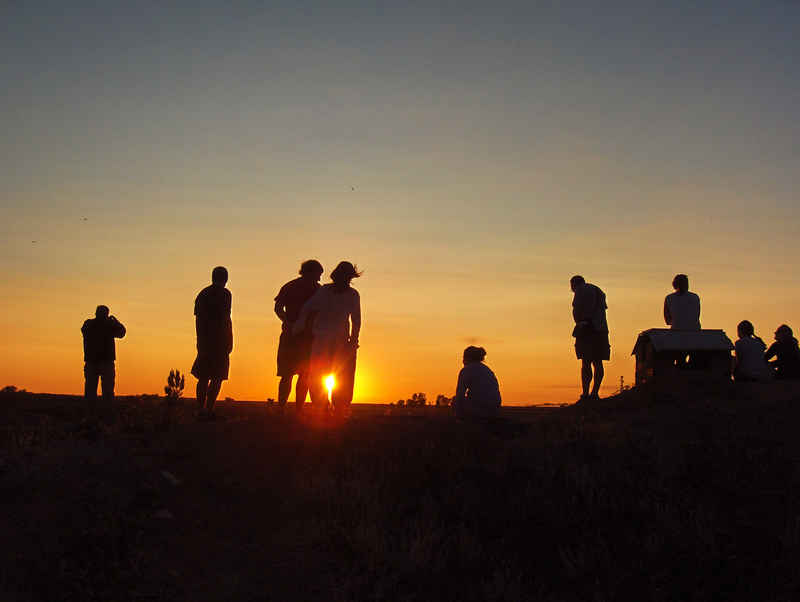 Take precaution with summer weather and the heat, there are not enough shadows and the sun can get really intense. If it rains we can find really the muddy path by the Aquitana Via (from Carrión a Calzadilla to la Cueza), the Trajana Via (alternative road) and the entrance to León through Arcahueja. The number of kilometers of this stage is high so we recommend you to ration your phisical resources. Even though. It can be perfectly taken because the whole road is flat so it allows you to travel faster through all the distances. Today we leave behind Palencia and its Tierra de Campos to immerse ourselves in León, arriving directly to its capital and icon: The wonderful Gothic Cathedral of Santa María. Many paths that will take us there, have kept the route almost unchanging since roman times. 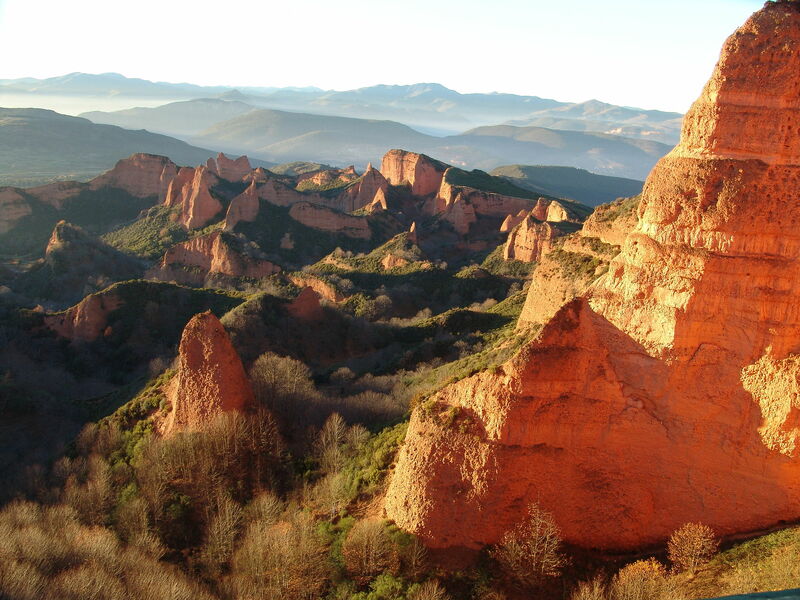 Those are roads charged with HISTORY (yes, with capital letters) that will allow us to discover the glorious past the big medieval organizations, like the one at Cluny in Sahagún or the one from los caballeros del Temple in Terradillos de los Templarios. As we make our stops we will say goodbye to Tierra de Campos passing by, today more than ever, and big golden extensions of cereal with a very simple profile. This is easy stage, yes it is long but with not many stops, that encourages us to let us travel physically as well as mentally. It is, indeed a road to open your eyes and let your mind free. Are you willing to keep on Reading and discover what el Camino is holding for you? 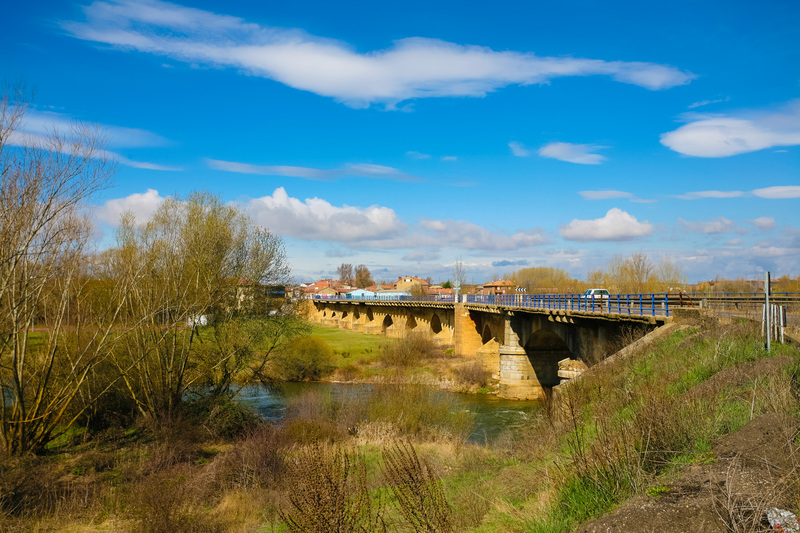 In order to go out of Carrión de los Condes, we must go across the Puente Mayor and pass nearby San Zoilo. If you didn’t visit the monastery the day before, this could be a good time for you to do it, even from outside. After crossing two roundabouts, we will cover the PP-2411 during 3 km, a two-way road in which the travelers walk on foot by the sidewalk. Even though you can’t see it from the highway, we will go by near the ruins of the old abbey of Santa María de Benevívere, ffounded in the XII century and abandoned after its confiscation from XIX century. Regardless of the organizations that tried to save it, the building was demolished and the documents that were guarded there were translated to Archivo Histórico Nacional (National Historical Archive). We get to the arriving point on the road with the straight land path that leads us to Calzadilla de la Cueza, in a point where the PP-2411 turns right. This road on good state –unless it rains and it gets muddy- It’s the old Via Aquitana . Actually, in roman times, they used to call it like that the road which joins the shores of Galia (Today, this territory is France). 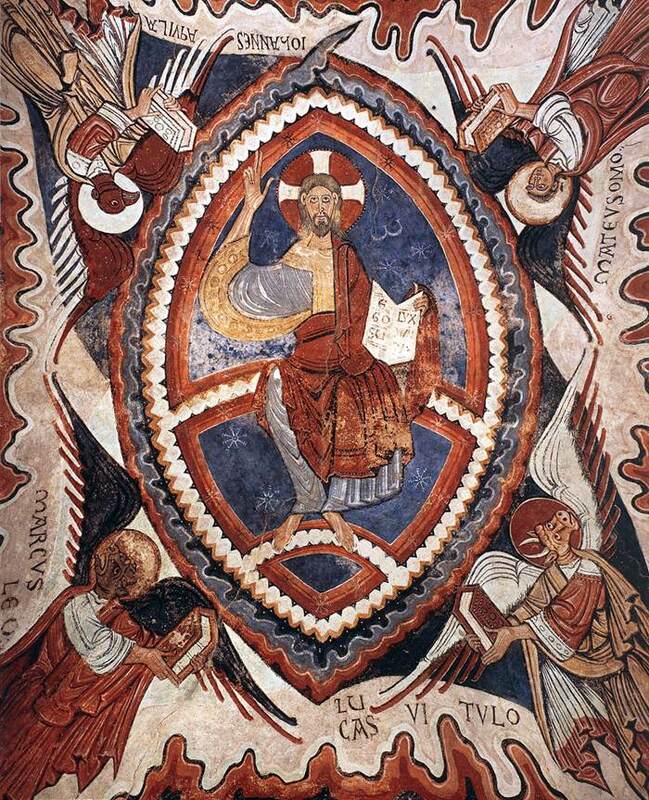 But, in the Middle Age, they started to call it with the same name as before, the name was </spanAb Asturica Burdigalam” which united Astorga with Burdeos. Since the beginning of Pilgrimage in Santiago, the Jacobean walkers used this old way and thousand of years later, we continue to follow their steps. In spite of the feeling of historic communion that sets off to continue a rout that has remained unchanged for centuries. We must say that, at the end of the day, this road is really hard whether psychological or physically. 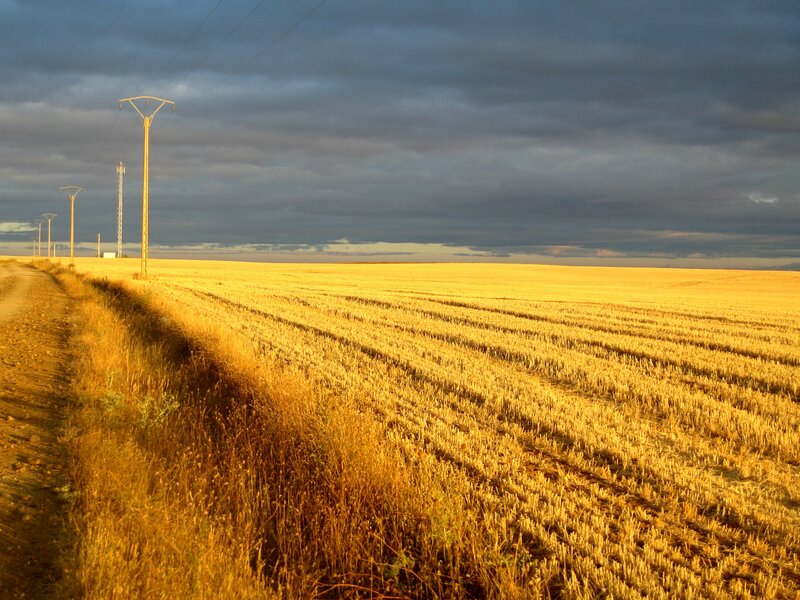 We travel all this road of 12 km in a short matter of time because of the facility in the flat profile, but the travelers walk hours on feet through this road without trees springs nor anything that alters the country landscape of endless cereals. Before, there were two hospitals for pilgrims specifically in this part of Via Aquitana. Today, we can’t find any type of service, except for a van selling drinks and food which is located at the intersection with P-2469 during few months of the year. After this intersection, we can also find a sign indicating the way to the Real Leonesa cattle route, right next to a recreational area. A cattle route is a road that connects all the places where the livestock is abundant at winter and summer in the search of meadow where to graze. La leonesa is divided in the western and Eastern, this being the last one. It has around 700 km as a total and unites Riaño (in León) with the south of Badajoz, going through six different providences. After this one-way road, we arrive to Calzadilla de la Cueza (km 18 of stage), hidden behind a final change of slope. There, you will find all of the services that you need. The route borders the town by South and leads into N-120, exactly where we cross the Cueza stream. The walkers goes through a parallel path to the highway until Ledigos, you can decide whether you prefer concrete or land. It implies around 6 km in a vertical light slope, with a descent of height just before arriving to Lédigos..
Just as Calzadilla, today Ledigos doens’t count with a big patrimonial herency. From Calzadilla stands up the Renaissance altarpiece that is located at the San Martín Church and, as an anecdote, saying that parish church from Legigos is one of the fewest that counts with Santiago el Mayor symbols in all its iconographies: like pilgrim, apostle, and boaster. From Ledigos the road takes the same way of the N-120 until Terradillos de los Templarios (27th kilometer of the stage). The name of this locality is named in an architectonic and historical way: place of small flat roof linked to the old Orden Del Temple.. In the previous stage we mentioned this order of knights, founded in the XII century with the purpose of protecting the pilgrims in Jerusalem and this protection was extended to Camino de Santiago. As we said, they collected so much power and wealth in only two centuries that even the King of France owed them a big amount of money. This ended up being the ruins of los templarios, because they turned into a big threat for the Crown and the rest of the religious organizations. Because of this, the Pope ordered the dissolution of the Order by force in 1312. These knights accumulated so much power in such a short period of time that it brought up so many types of legends, regarding the source of their wealth and also the Order rituals. They were given, for example, the possession of miracle relics of Santo Grial and, even that story of “The Goose That Laid the Golden Eggs”. In fact, this legendary animal is connected to the locality of Terradillos. This town was in a territory under the jurisdiction of los templarios and located inside there was a hospital for pilgrims that was under their protection. The legend from the town says that los templarios kept there the goose and, due to the big inminence of his order’s dissolution, they buried the mysterious bird in a higher part of the town. In town, there is also a shelter named after the last Grand Master who had the Orden del Temple, named Jacques de Molay. In order to get to Sahagún from Terradillos we have two options: going through the Jacobean route or skipping it and going through the N-120. Keep on mind that if you continue through N-120 you will not pass by Moratinos or San Nicolás del Real Camino, the last localities from Palencia. After passing the territorial limit, you will cross the Valderaduey River and see to your right the perpendicular path that leads to chapel of the Virgen del Puente. If you don’t take this one and continue through the highway, you must know that for entering Sahagún you have to change course by the right track. If not, you will border the whole León locality by the North and you will go straight forward to the road fork in Calzada del Coto. As well as we can sacrifice the visit to Moratinos or San Nicolás with the purpose of making this kilometric stage much easier, in Tournride we do encourage you to enter to Sahagún (41th Kilometer of stage). It is a great place to rest and one of the most important localities from Camino Francés in León, with a lot of patrimony and history to discover. The Jacobean route goes out from Terradillos through the West path; it is a firm and land route with a light descent until flowing into the P-973 where, after covering a few meters, we will change course to the right so we can pass by Moratinos and San Nicolás del Camino. It will always be a land field with small pebbles and the profile will alternate soft ascents and descents until we get closer to the N-120, where we will go down softly until we get to Sahagún center. 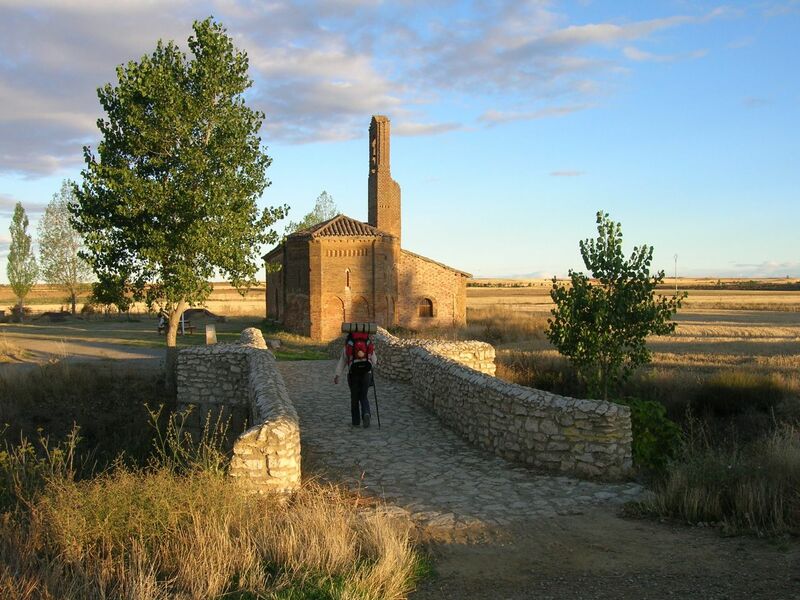 Before arriving to Sahagún we cross the N-120 to get to a path in the river Valderaduey meadow that leads to the chapel of “la Virgen del Puente” (only 3 Km away from Sahagún). 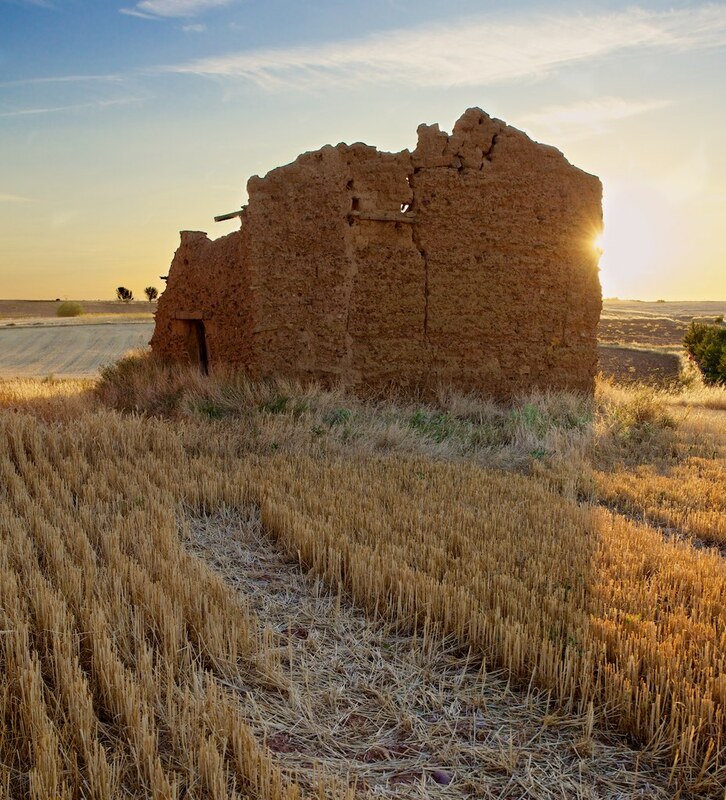 The building, with a mudejar style provided services for years as a pilgrim hospital and today it is bordered with a nice grassland with seats, where we can also find sculptures that remind you of the glorious medieval past of Sahagún. 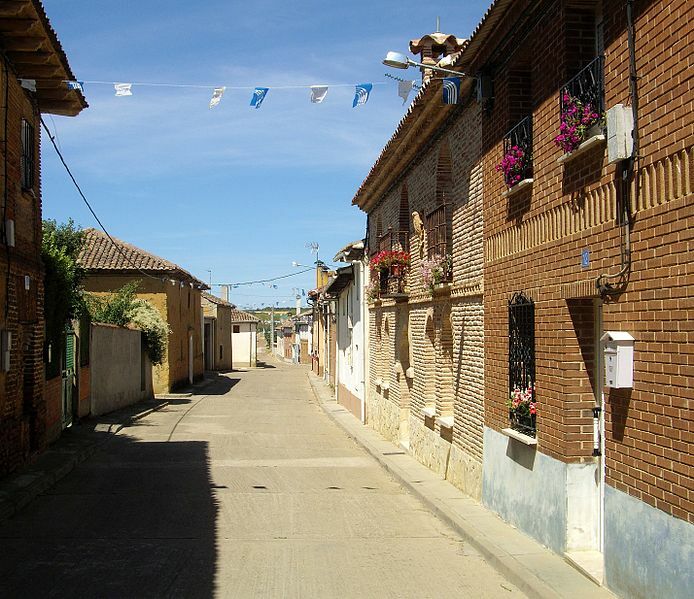 Yes, Sahagún does have a great historical past! 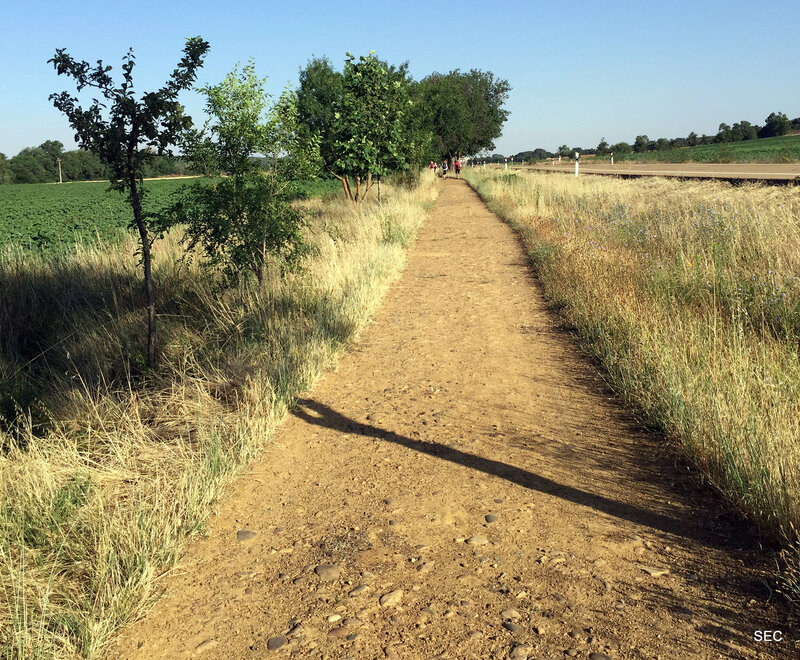 To get to know it, we must take that path that goes out the grassland of the chapel of la Virgen del Puente and that leads us to cross the LE-251 (must be very careful in this point). From there, we’ll enter to Sahagún but, to get to the center, we must cross the train ways through an underpass. 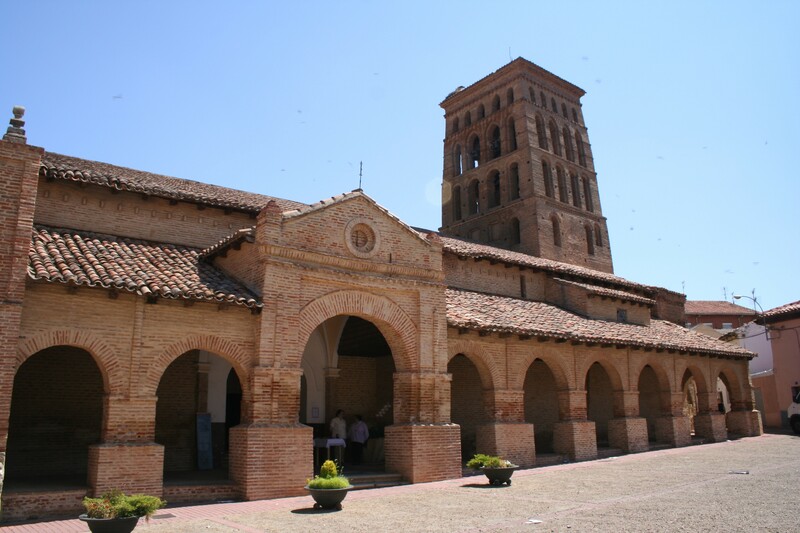 The story of Sahagún goes back to the roman era, when it was located at the Trajana Via pass but it was actually created from the foundation of a medieval monastery where the relics of the Santos (Saints) Facundo and Primitivo are kept. 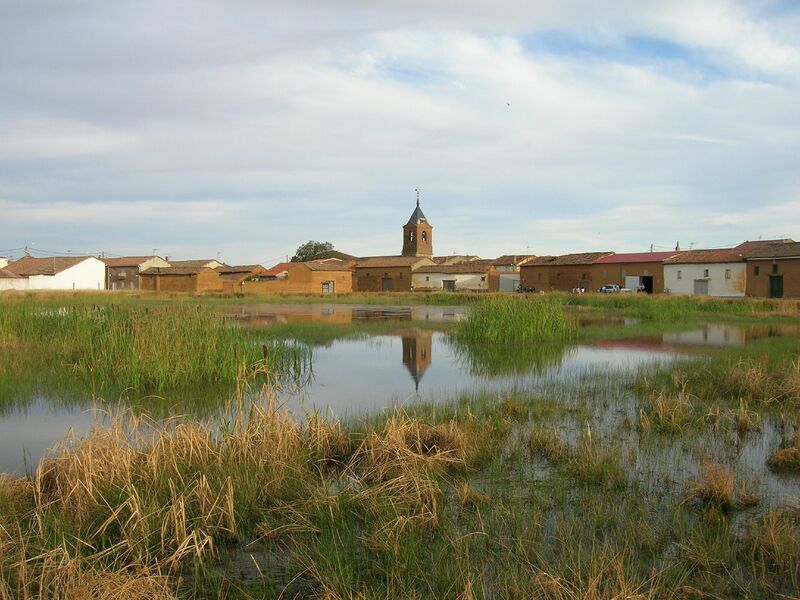 In fact, the name of the village is derived from there: “Sanctus Facundus – Sant Fagund – Safa-gun – Sahagún”. This saints were beheaded in the II A.D century, close to Cea River, where some of its disciples buried them. The place was getting recognition and in the IX century, it was decided to build a big monastery that the Cluny Order took care of it..
As we already mentioned at the beginning of this French Road way by bicycle the Cluny Order created a whole net of monasteries during the whole road where they gave shelter to pilgrims, thanks to the help given by the crown. In Sahagún, the Monastery Real de San Benito received several privileges and special privileges and, around it, it was created a big medieval fortress, dependent of him. 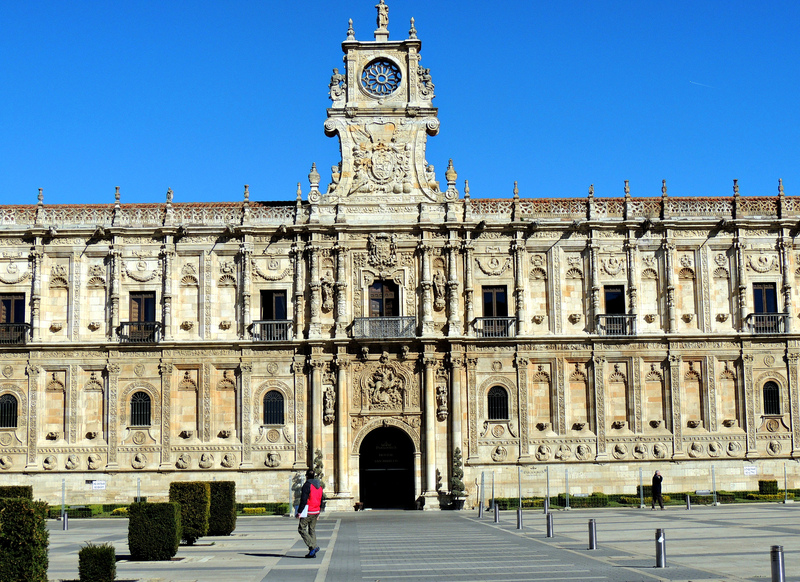 The monastery even got to create his own University, that was similar to the one in Salamanca or Alcalá de Henares judging by its reputation. The abbot of Sahagún got to have so much power and authority that by thr XI century, there were a lot of riots from the middle-class against his power excess. Since the XV century, the village starts to decease, validate determinedly with the confiscation from the XIX century, when some parts of the old monastery were put out to tender publically. We only have left today la Torre del Reloj (Clock Tower) and El arco de San Benito (San Benito Arch), the monastery’s old south cover. Kings sepulchers and other objects that were inside the monastery were destructed or you can find them today in other places from the village, or even in some museums in León. 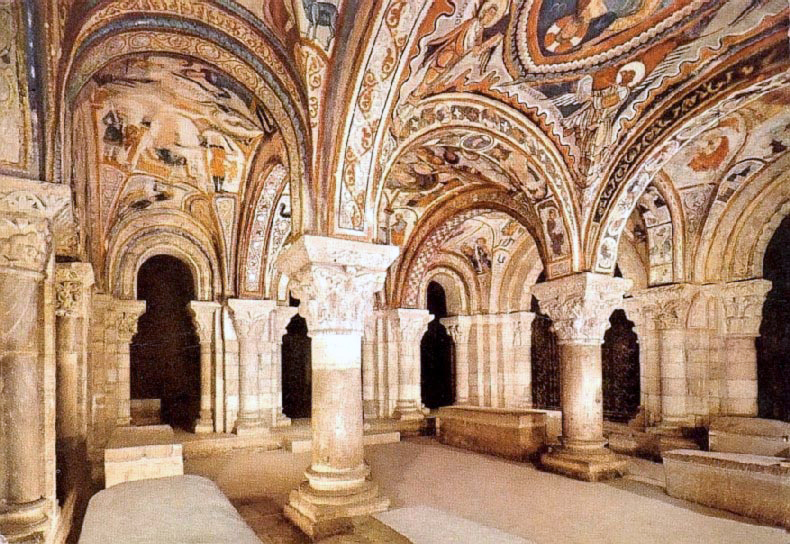 For example, in the Monasterio de las Monjas Benedictinas (from the XVI) are kept some of the ruins of the old Real Monasterio, because this place offers services as a museum. On its pieces you can find the Alphonse XI sepulcher and four of the wives he had, kept in the church of the convent. Right next to the ruins of the Cluny Old Monastery there is one of the village emblems: the San Tirso Church (C. XII). It was one of the first buildings at the peninsula where instead of using stones, they used bricks. This could look like a trifle but actually it gave room to the romantic-mudejar style, an icon of Spain united cultures and how such an influence was produced between them. Here, some Muslims that lived in Christian areas used constructive methods a lot of more ideal for their art (building with brick, and using horseshoe arcades, etc.) with ones clearly romantic in a very ideal European style. This attracts the attention mainly their four-part horseshoe arcades tower. Once we exit Sahagún we must cross the Cea River through the stone bridge and cover the whole highway until flowing into the N-120. After covering it for 2 km we will arrive to a highway junction: the N-120 gets lost in a left curve after an intersection with the LE-6711 that crosses by a underpass the dual carriageway. If we go up that high pass, we will take an alternative path, that will take us to Calzada del Coto and then by land paths until we get to Calzadilla de los Hermanillos. Once we alternate after few concrete paths, we will flow into Mansilla de las Mulas. At Tournride, in this case we recommend skipping the alternative road and follow the original trace that leads to Burgo Ranero. In the curve of the N-120 we will see a short path with signs that will take us to a long concrete way very easy to travel, that we have to keep on taking for the next 32 km until we get to Mansilla de las Mulas. Pilgrims on feet go through a parallel path full of banana trees, but it can be considered as a bit narrow. This road is not quite circulated by and that makes the profile very simple. After 5, 5 km we will get to Bercianos del Real Camino, a small locality with less than 200 people with all the services that we need. After others 7 km of concrete way, in a light ascent profile, we will get to Burgo Ranero. El Burgo Ranero place-name has been a controversial subject. The majority of people think that the name comes after the frog croak that lived in the closest ponds to the locality (to the “burgo”). Even though, there’s an old document which makes reference of the place as “Ranerium”, that would be a Latin word of a German name. According to that, the “de Ranero” would indicate possession, meaning the fortress of some sir named Ranero. In the actuality, the place represents an oasis for pilgrims that usually take many hours to walk a charming but monotonous landscape. And it’s in there where there are lodging and good services, that’s why we will not have any kind of trouble finding the things we need. It’s important to recover all your strength to face the next 13 Km to Reliegos, by a road identical to the former one, and practically in a straight line. One thing is certain, we practically won’t have to pedal because the road in a soft but permanent descent. It won’t take us much longer! Reliegos was, until a few years ago, the last place were a big meteorite landed in Spain. It was around 8 in the morning in 1947, when a huge rock around 17kg landed at the Calle Real of the locality, scaring all the neighbors, who took it as a bomb or a big explosion. Today, the biggest part of the rock is located at the Museo Nacional de Ciencias (National Science Museum) in Madrid, even though there are more fragments in other places..
After visiting Reliegos we must keep going through the road full with banana trees in continuous descent during another 6 km, until crossing the N-601 by a overpass and entering to Mansilla de las Mulas. 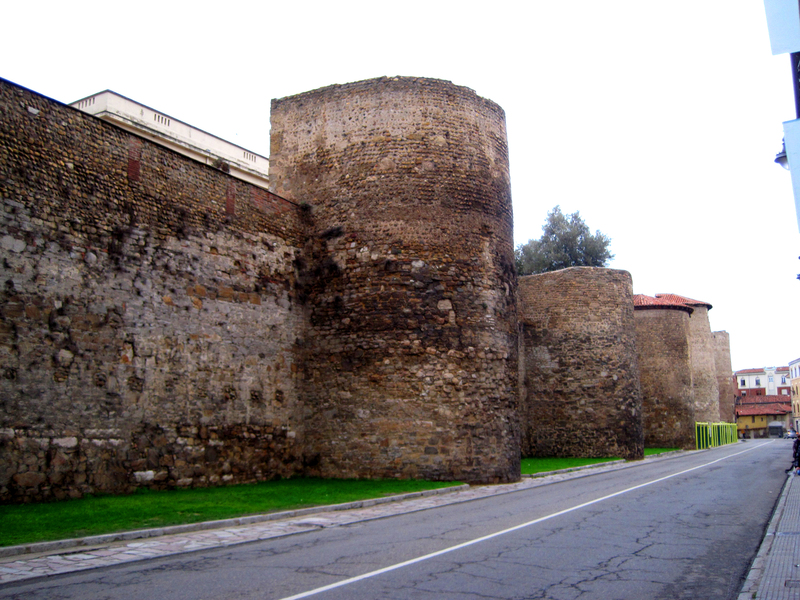 From El Burgo Ranero we enter to Mansilla by the door of el Castillo, one of the doors of the old wall of XII century. This place had one of the best fortification systems of the entire Castilla. The walls bordered the river shore and they headed to Northwest only on the bridge that crossed the Esla river. It was about 14 meters high, with battlements in the upper part. Also, there were some huge semi cylindrical cubes every 40 meters, which in the actuality they are preserved in the south part of the Wall. After going across the old fortified door, we will pass right next to a monument dedicated to travelers and we will get to Santa María Church right after. With date from the XVII century, it has a simple architecture. Following this road we get to El Pozo Square, where we join way with the alternative waythat passes by Calzadilla de los Hermanillos. Before leaving by the eight-arched bridge that crosses Esla River, with a medieval style but very recovered (C. XII), we leave behind the old convent of San Agustín. This cultural center was founded in the XV century, it was really important in a cultural level, making its library and archive stand out. All the documents were lost thanks to a fire during the Independence War, same thing that happened in Carrión de los Condes. What it is best preserved in the actuality is the chapel of the Villafañe, having square floors and a cracked vault. Besides, all those Jacobean symbols sculpted with stone in one of the old entrances of the convent, testify the importance it had as a hospital for pilgrims. .
Once we are at Mansilla de las Mulas we arrive at León in less than 20 km, and we will get there by highways or the road paths. Both options are united in different points. We leave Mansilla by crossing the medieval bridge already mentioned, later on, we will see to the left a wide path that goes on in a parallel to the N-601, in a flat profile. Whether it’s by highway or by path, we are at the 4 km we will pass nearby Villamoros de Mansilla and, later, we arrive to Puente Villarente in no more than 1, 5 km. Once we enter to this place, we will understand right away why Villarente has this name. If we go by highway we will cross the huge bridge where that traverses the Porma River. If we go by the path we can see it from below, because they have built some pretty wood walkways that cross the entire river and let us appreciate the view of the whole bridge, it was made like this because going by the shoulder was too dangerous for the walkers. The Villarente Bridge originates in the roman era, even though there is no physical proof of that era.. Porma’s floods destroyed everything during many historical moments and that’s why only the central arches are the only old demonstration preserved from the medieval times. This is some kind of landmark in the French Road, representing a medieval pilgrim love legend. In Villarente we could find a pilgrim hospital in medieval era that was known for having a rule that stated they needed a female donkey who would carry the unhealthy walkers all the way to León (as it were some kind of “ambulance”). It is rumored that at the beginnings of the XIV century, a girl named Elizabeth used to work in this hospital, engaged to an Andalucian man. One day, a very sick pilgrim arrived to the hospital. She took care of him and they ended up falling in love with each other. One time they were standing up underneath the first arch of the bridge and they marked their outlines of their hands in the stone arcade, that’s when Elizabeth promised him if he returns from Santiago in about 14 days and places his hand there while calling her, she would leave her fiancé so they could run away together. The pilgrim man went to Santiago and could return back to Puente Villarente the 13th day; however it was impossible for him to go to the arch because the river had risen due to the continuous rainy weather. He laid down the Porma’s shore, praying to Santiago so he could help him reach the stone arch the next day. When he woke up, he realized that a big line of trunks created a way between the floods that could lead him to the exact place where they had placed their hands. He ran over there and immediately called his beloved; it didn’t last much longer when she appeared throwing herself in his arms and willing to spend the rest of their lives together. With this beautiful story in mind, we cross the Puente Villarente and we go out through a wide sidewalk next to the N-601. 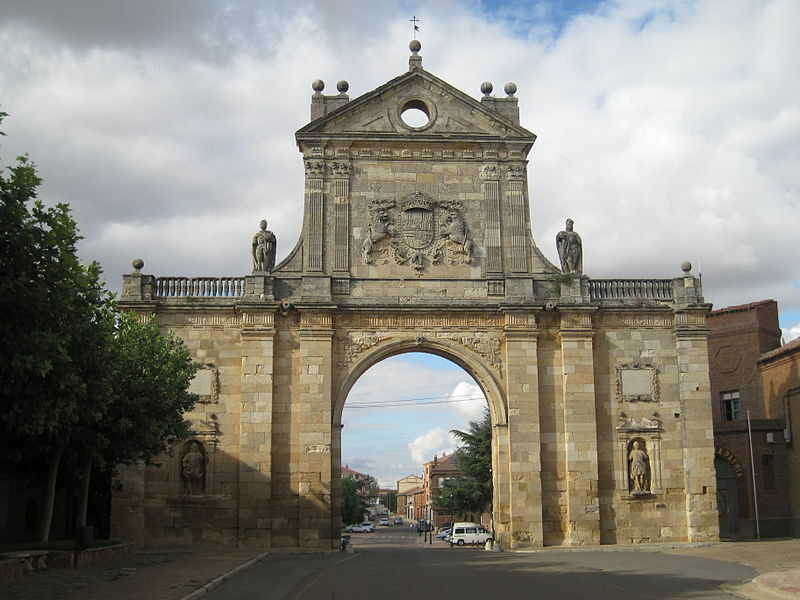 There, we have two options to enter to León: we must choose between going through Arcahueja or going by the N-601 until we arrive to the city center. If we choose the second option we must be careful with the traffic, especially in the Industrial Estate part, but the advantage is that the profile will be simpler and we will skip any highway cross line or any overpass. 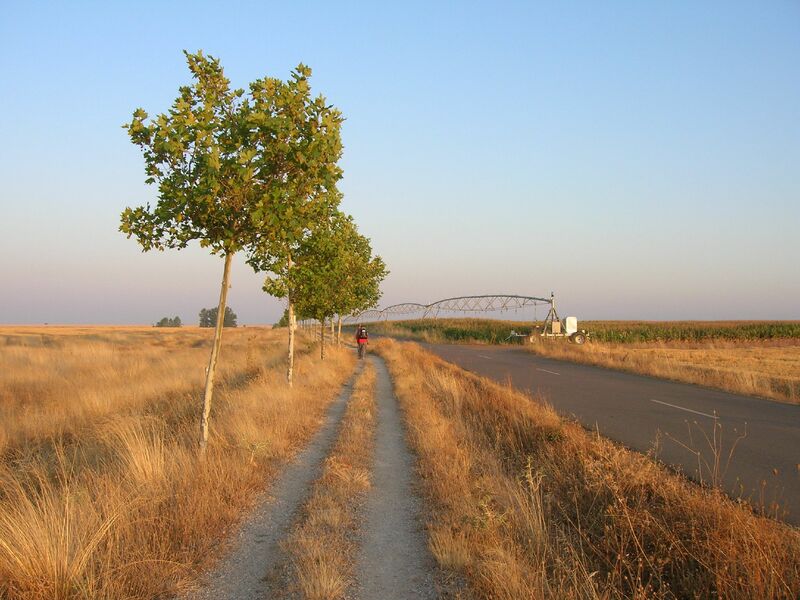 If we choose the path to the right making way to the exit of de Villarente Bridge, we will travel almost in a flat way until we get to Arcahueja, where we will find a short ramp that takes us to a path close to the highway, which we will take in order to get to Industrial State. The N-601 goes over the middle of the industrial estate and we must cross by a blue-painted overpass. Going down to that point, we cross again by another overpass in a road junction, the solid ground will become concrete as soon as we get to Madrid Avenue. When we see the parish church of Puente Castro we should change course to left, crossing the Torío River through a pedestrian bridge and following the avenue until a roundabout, where we will get to La Plaza de Toros just by turning left. From this point, we will go into the monumental area, turning right. We continue forward until the narrow street, that if we turn left it will take us directly to the cathedral. It’s true that this entrance could be a little confusing for cyclists because of all the turns, crossroads and pedestrian crossings we have to pass over. If you want to make it simpler, you can go through the N-601 until we get to the first roundabout of the city, moving forwards through the Europa Avenue until the Reino de León Avenue (first highway exiting to the right obliquely) we keep on moving forwards passing by 6 perpendicular street crossroads, you will only have to turn left in the San Pedro street so you can get to the cathedral. . We mark this whole journey en in yellow on our stage map. León is one of the greatest, an historical city and a must-see during the French Road. And further than that, it represents a breath of young and fresh air, a dynamic city full of vigorous culture: bar concerts, art exhibitions, among others. This is the kind of life we get when we make our way in this city, in that existential movement in its monumental area, which encourages the travelers to join the fun. Cities like León, being such a big-sized city, often overwhelm pilgrims who arrive late and tired. Having to get correctly informed and design a route that allows us visiting all of those places calmly, can become a really hard job to do after a long stage. It’s such a shame that it is so hard for us to decide visiting the places when we have so many options to enjoy. That’s why, we decided in Tournride to make this whole process easier, after relaxing from all the effort you have made today, you get motivated to go on a walk: we will give you a map with the whole walk itinerary and we tell you what you will find exactly in each point. This only lasts 40 minutes, 40 minutes that are truly worth it. For those thinking about taking a relaxing day in your road, you must know that León is the best option to do this. Also depending on how late you go on your walk, some of the visiting places could be closed. Unless you would want to visit them in the morning before pedaling your way up to the next stage, you can spend a whole day visiting those places calmly, it could be an entire day dedicated to this magnificent city. Let’s enjoy León, a monumental city with a lot to offer us! León owes a big part of its current configuration to romans. Before the Italian conquerors arrived, this part of the territory was deserted. The roman army was organized in legions, a type of military units with its own internal hierarchy. They would move in order to conquer territories or to perform some specific missions. In the year 29 B.C. the Legio VI Victrix (“Sixth victorious legion”) created a provisional military camp at the high plateau of the junction between the Rivers Torío and Bernesga.. This was an ideal place to make sure of the water supply, and it was located at a good communicational passage between the North and the center of Hispania that they were trying to control. In the same years, they began to explode intensely a huge gold mine located nearby León: las Médulas.The extraction method used by the romans, called “ruina montium”, has left a spectacular landscape in this area that it’s worth all the time in the world to visit. The waterways used to be diverged and letting loose the current all at once, demolishing quickly big parts of mountain. Thanks to this method the Romans extracted a lot of gold. A permanent settlement was needed in order to control all the resources. That’s why, whenthe Legio VI Vitrix had to leave to fight in the Rin in the year 74 B.C., the Legio VII Gémina came as a substitute.. This legion created a much better elaborated camp. In the actuality, in León, there is a lot left from what the Romans made back from I to III A.D. . The current Ancha Street that leads to the cathedral was the old roman “thistle”, the main north southern street of the camp that made junction perpendicularly with the “decumanus”. 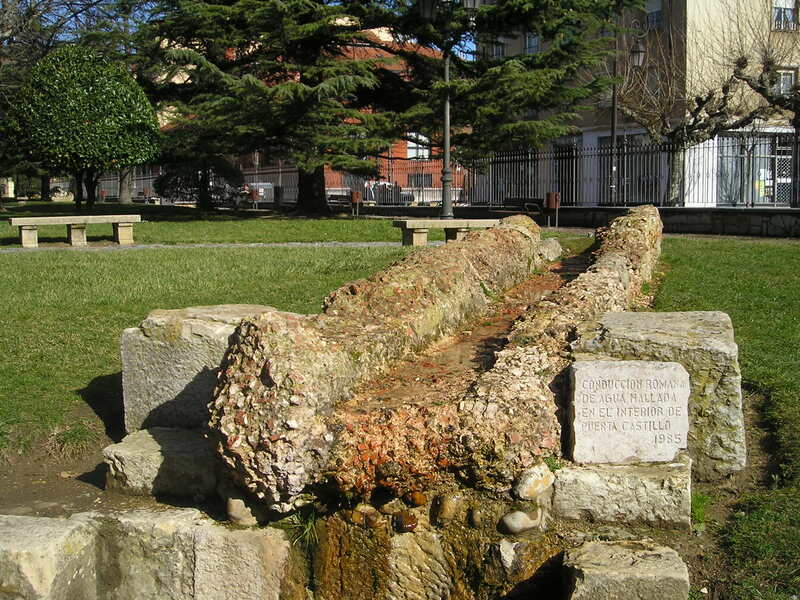 Under the cathedral, there are ruins of the old roman baths, and in the Cid garden, some ruins of the whole pipeline system. With the defeat of the Roman Empire, the Swabians took possession of the old camp and transformed the buildings into proper living places that would remain through time, like the roman baths. Later, the Visigoths conquered the territory and the settlement was almost deserted. This situation remained standing like this during the Arabic conquest, because León remained in a middle area between both fronts. In 856 King Ordoño I succeeded on conquering León, so it became part of the Asturias Reign. Years after, the disputes about power between his three grandsons ended up by uniting the territories of Asturias and León at the León Kingdom, so this settlement became a capital for the first time. In 1188 León goes down in history by being the first place where a King organizes the first Assembly of all Europe back in the Middle Age. That’s why this city is known as “The cradle of parliamentarism”. 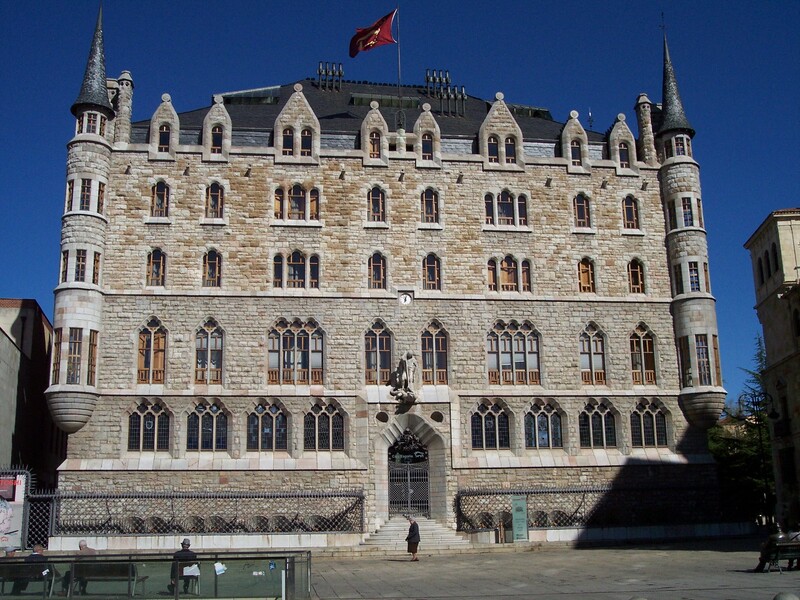 During the following centuries, León kept growing, becoming of the most important cities for the crown and for the Santiago way One time, it had like 17 hospitals for pilgrims and was the western headquarters of the Military Order of Santiago. In the XIX century it became the providence capital and in the city gets and expansion district in an orthogonal design. León became then, the big dynamic and modern city that we all know today, even though some marks of its past prevail in its streets and monumental buildings that we can all visit today. You can visit this webpage, to see them more in detail where you can find historical virtual recreations of León. We start with the city’s most emblematic symbol: The Cathedral, also known as the “Pulchra Leonina”. This nickname already gives an idea of what the visitors will find in “bella leonesa”. 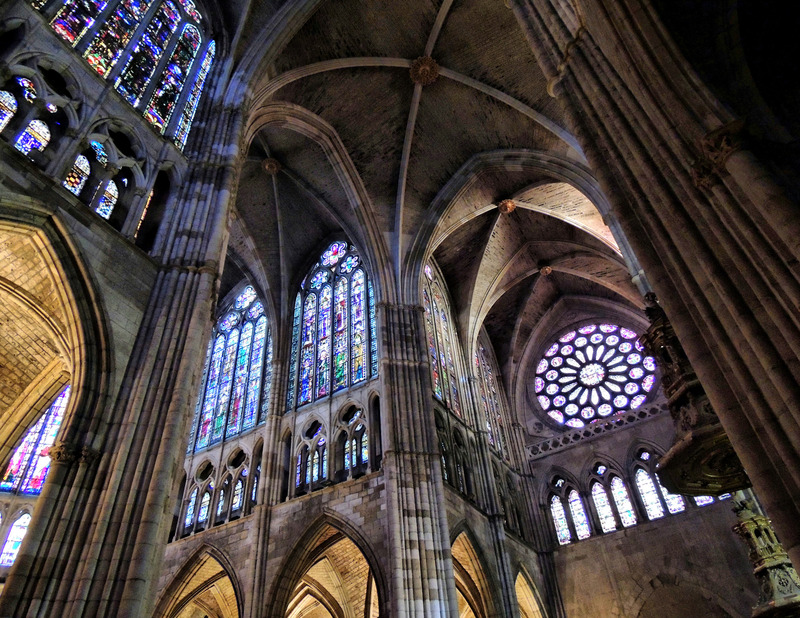 The beginnings of this was in 1275, once gothic was as its peak, having a lot of similarities with temples of Reims or Amiens. SWithout any doubt, the most impressive thing about this Cathedral are its glass vitrines, without taking credit away from the details in its stone sculpture or the amazing height of its walls and towers. 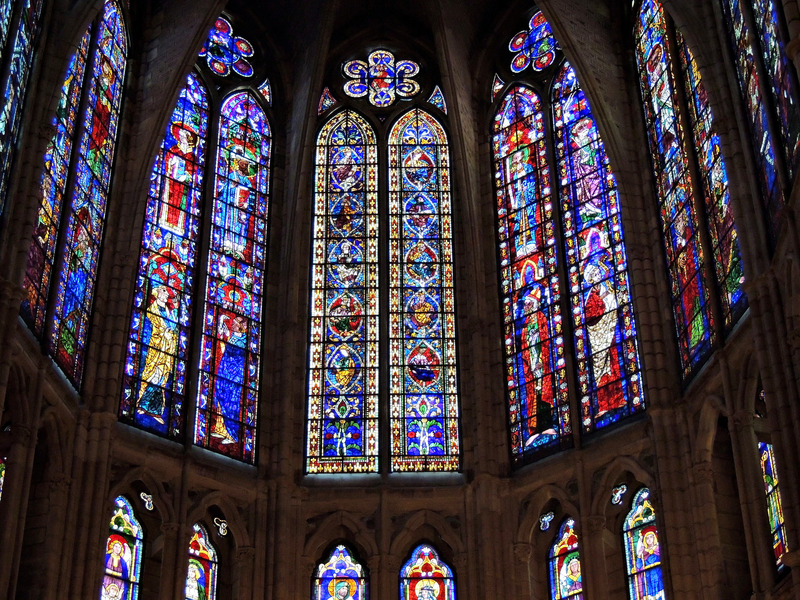 Being put in a radiant gothic stylish frame, its tripartite elevation opens the walls all over its parts to insert polychromatic stained glassed window that paint the inside of the temple with multi-colored lights. As these vitrines already followed a specific iconographic program, the inner architecture of the gothic cathedrals resembled practically aniconic. The sculpture was taken outside and the three covers of the external western facade are kept in an impressive cycle. 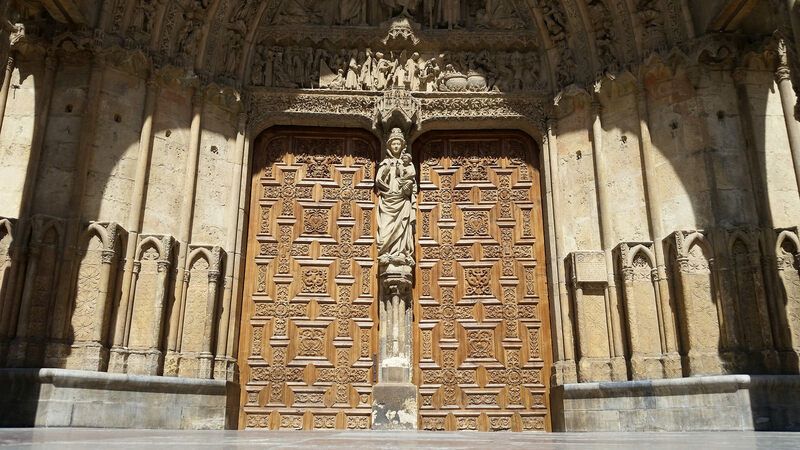 The main door is dedicated to la Virgen Blanca (The White Virgin) and also represents parts of the Final Judgment. In detail, we can mention that the current Virgin’s sculpture located at the mullion is an exact copy of the original that it’s kept inside the temple for its maintenance. To the left, there is la Puerta de San Juan, with scenes from Jesus’s birth and the first moments of his life. To the right, we have la Puerta de San Francisco, dedicated entirely to tell stories about the Virgin’s life (her death below, and her coronation above). 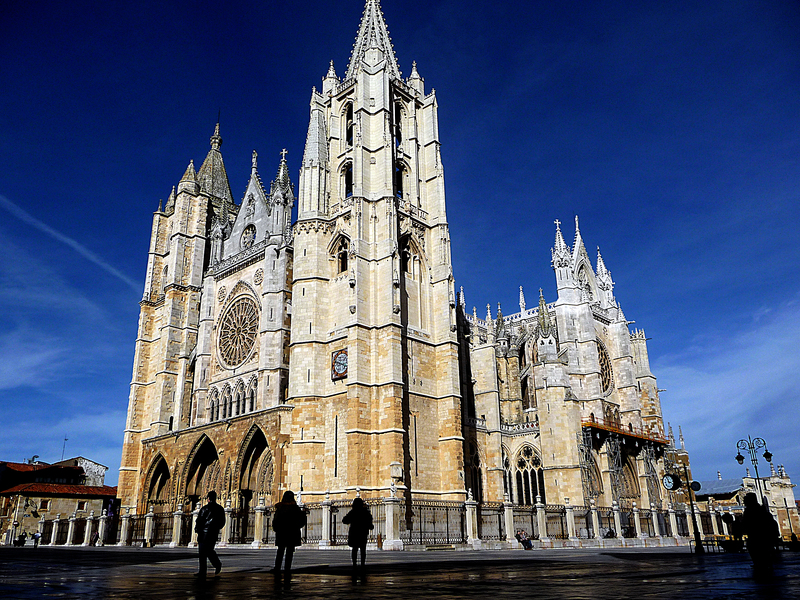 The cathedral of León is one of the most monuments of the entire French Road that deserves an inside-visit. Because of its architectonic style, it’s precisely designed to amaze people. We highly recommend you, as long as you can, to take time out of your journey this visit. You can find more information on this page about prices and schedules. BWe go down the cathedral through the Ancha Street, built above the old roman “thistle” At the back; to the right we can get tour view of the great Casa Botines. This Antonio Gaudí work of art is one of the fewest buildings that he made outside of Cataluña. We will see more of those in the next stage: the Casa Episcopal de Astorga. This was a Catalan businessman, named Joan Homs i Botinàs, that handed over the design of this building to Gaudí at the end of XIX century. Below, he opened fabric warehouses and above, Joan built a normal place for. With an unmistakable modern taste, the building is framed in a neogothic style. If we finish visiting this cathedral, we can’t avoid how the lobed archs with little columns remind us of the triforium of Pulchra Leonina. In general, the towers placed in a corner and its strong appearance reminds us of a medieval palace, but its modernist air makes it way more elegant. 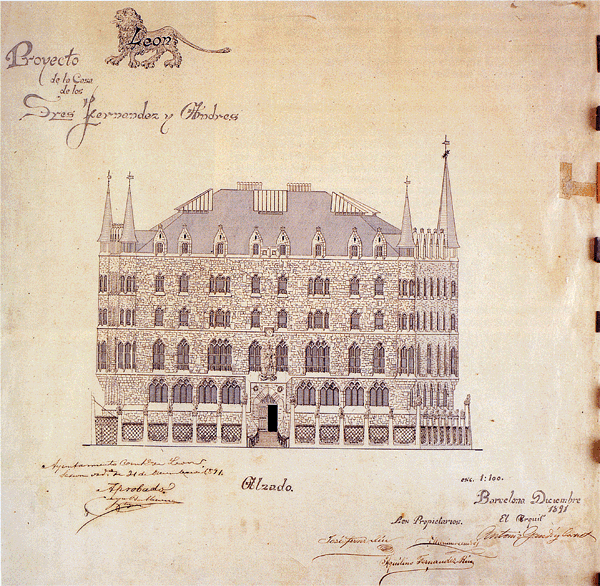 In the actuality, the Casa Botines is the Caja España (a savings bank) headquarters. In 1996 this organization restored the whole building trying to eliminate the remodeling made after Gaudi’s death. Today, we can only have access to de bank office area. The visit is for free and the schedule is from 8:30 to 14:00. Surrounding the Casa Botines to the east, in the Ruiz Street of Salazar, we go ahead to the Basilica of San Isidoro. We propose turning right to Pilotos Regueral so we can take advantage of the road visiting the Cid gardens, a small hidden treasure located in the old part of the city. While we recover our energy in one of the pews, we can contemplate some ruins of the roman pipeline systems. Going forward by the Cid Street, in less than a minute we arrive to the Basilica of San Isidoro. Within this facility, it is located the Panteón de los Reyes (The Kings Pantheon), named “Capilla Sixtina del Románico” (the Romantic Sistine Chapel). It is a squared area divided in six vault sections covered entirely by paintings of the XII century, with an outstanding state of preservation. This impressive legacy is held up by tick columns with big capitals full with decoration themes, resting inside sculpted sepulchers kings and consorts. 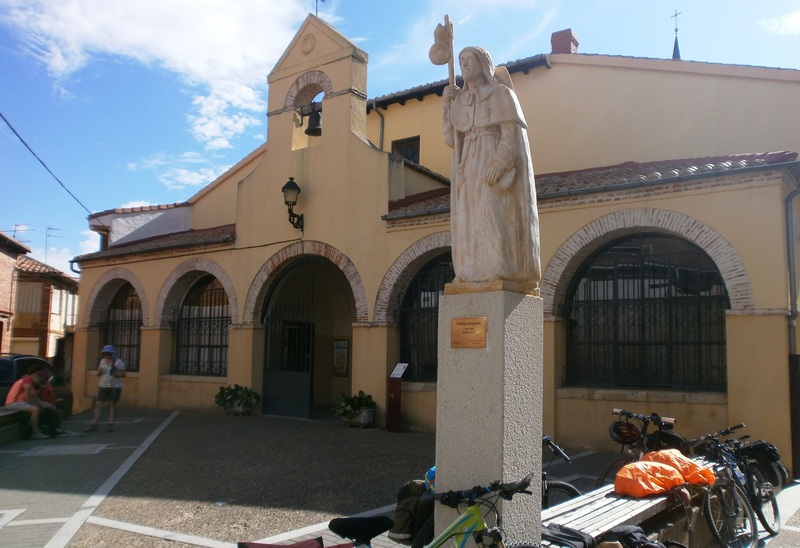 PTo visit the cloisters, the Panteón de los Reyes and the San Isidoro Museum, we have to go directly to the small entrance to the west, located at an extreme of the square. It costs around 5€ and includes a guided-tour, which we highly recommend here in Tournride. Bodering the Basilica of San Isidoro through Sacramento Street, we turn obliquely to the left so we can head to the Suero de Quiñones Avenue that will lead us directly to San Marcos Square. We are welcomed in this place by a pilgrim monument. A man made of bronze looking over to San Marcos. He is barefoot, sitting below a cruise and dressed with the pilgrim’s staff and the Jacobean medieval clothing. 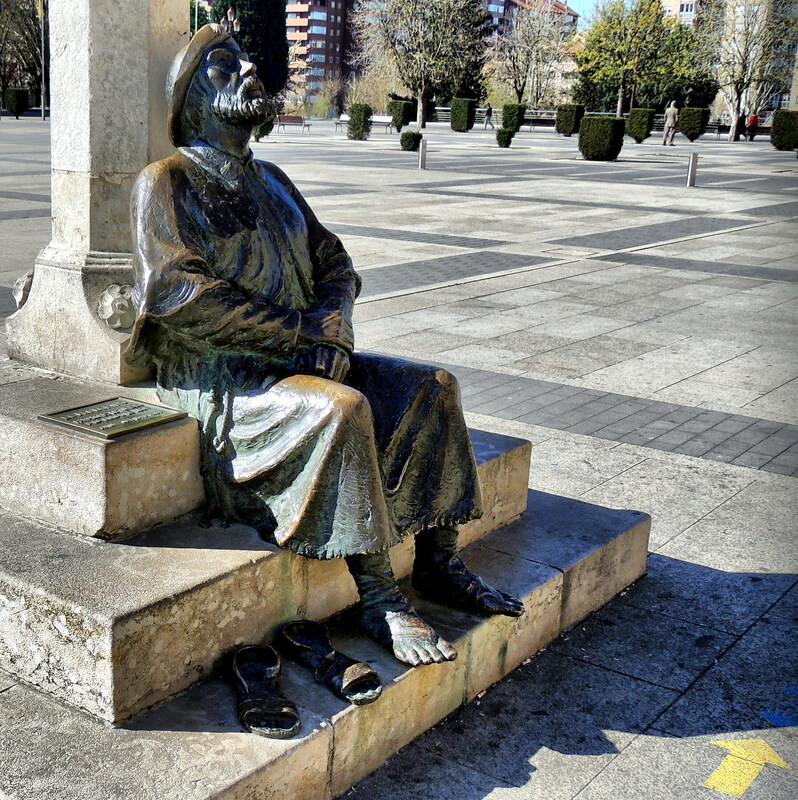 This sculpture not only makes reference to the importance of what the French Road made to the glory of León capital, but also the origin of the main building of San Marcos. In the XII century a child made a big donation to build a huge building for pilgrims outside the city’s walls. This temple-hospital grew up and became headquarters of the Santiago Order, the protective knights of the Jacobean roads. In the actuality, there is almost nothing left of that building. Its disrepair made room for its demolition in the XXVI in order to build up this Renaissance masterpiece. The great plateresque facade is divided in two big sections, which uniformity and symmetry transmit some kind of calm even though it is covered by a lot of decoration. Under the plinth there are sculptured medallions with greco-latin characters example of the true Humanism and classic glory in the Renaissance time. Emperors like Julio César or Trajano, and artistic promoters of small pieces from the Renaissance period, formers as Charlemagne stares at us from their honored medallions. From the beginning, the group of San Marcos has been making multiple services.. It was before a hospital for pilgrims and a convent, but also a prison –where Quevedo was Locke up-, educational center, state office, and republican prisoners’ camps during the Civil War… Today it works as a National Tourism Parador, even though the church keeps on having a religious usage, and in addition there is a part that is home to a museum with sacred pieces. It is important to mention that this Parador has a cafeteria closet to the Bernesga River, with a pleasant terrace with view to San Marcos Bridge. This is an ideal place to relax. After all the knowledge acquired by the cultural visits from León, we can only finish the day in one way: Tasting the delicious gastronomy from the city. Even though the city offers a big variety in restaurants where you can find a balance between price and quality, in Tornride we recommend you going to the El Húmedo neighborhood, where you can visit bar after bar tasting the different specialties of each place. In the majority of them, they serve you those just by asking for drinks, and in some others, you usually pay for them. To get to El Húmedo enjoying of a nice ride we recommend you following the river’s shore until you get to Ordoño II Avenue, where turning to left you will get to la Casa Botines. Certainly it isn’t the shortest way, but it allows you to get to know a little bit more this other part of the city. 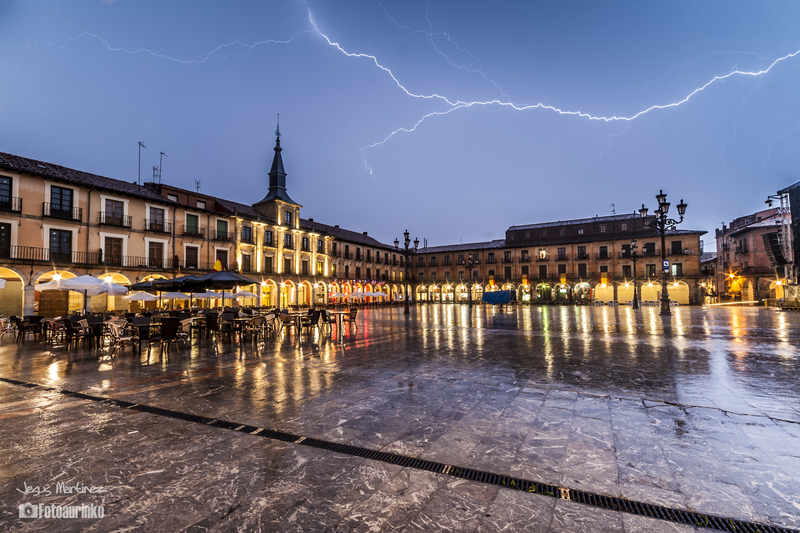 The entire area between the Ancha Street, the Mayor Square and the Cathedra is full with bars and restaurants. You can’t miss the blood sausage –this one is spread and along with rice, unlike the one from Burgos- and also the cured meat. With this delicious food, we say goodbye until the next stage. 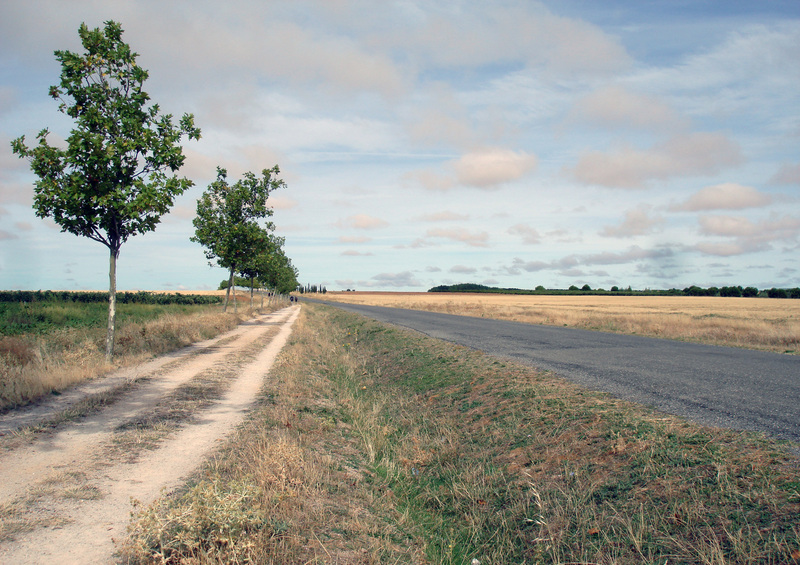 We will go to Astorga, where it’ll be our last day in a flat profile… We’ll have el Bierzo and los Ancares as the counterpoint to these plains full with cereal camps!